The Spirit ET-188 folding treadmill has the type of features that were considered exciting five or six years ago. For 2011 and beyond, you can easily find better-built, better-featured treadmills than this. 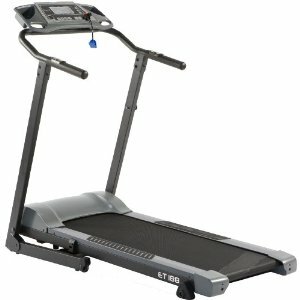 The Spirit ET-188 folding treadmill has a large LCD display readout for distance, speed, incline, and more. UPDATE: The Spirit ET-188 has been discontinued and is no longer available for sale. At just 112 pounds, the Esprit Spirit ET-188 folding treadmill is light and easy to fold up and store out of the way. It features a walker’s motor (1.75 HP Continuous Duty), a 7.5 mph top belt speed, three manually adjusted incline levels, and an easy to read display. Each time you use the ET-188, it records the usage in Odometer and Time readings, and will display total figures every time the power is turned on. That way, you will know how many virtual miles and actual hours the treadmill has been in use. The computer display will also alert the user when it is time to lube between the belt and deck, at every 180 hours and 600 miles. A tube of lubricant is included with the treadmill. The Spirit ET-188 is a very simple treadmill to assemble since it is almost ready to go right out of the box: simple fold up the attached support arms from the deck, plug in two console cables, and attach the console to the tubes with four screws. Plug it in and you are ready to go. On the downside, the ET-188 has an extremely short warranty, a smallish walking area, low power, and only so-so quality. 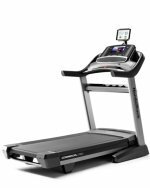 Spirit Fitness makes several excellent treadmills under its own brand and puts the budget machines under the Spirit Esprit name with the ET-188 being the absolute budget beginner’s model. Even at $589, the Spirit ET-188 is not a good representative of the type of quality that the Esprit line can offer. Too many compromises have been made to this folding machine in order to keep the price down. There are better treadmills out there, and if you are willing to spend just a little more, even up to $799, you can get a decent treadmill that will be more reliable and durable than this one. At this price level, compare the Spirit ET-188 folding treadmill with the Horizon T101 which has a stronger motor, better warranty, a power incline, longer deck, and much more.